This application protocol describes the generation of highly purified and viable neurons from neonatal mouse brain tissue. Brain tissue from mice younger than P8 is dissociated into a single-cell suspension and neurons are then isolated using an indirect magnetic labeling system that depletes non-neuronal cells like astrocytes, oligodendrocytes, microglia, endothelial cells, and fibroblasts. The cell number and composition of the resulting highly pure neuronal cell fraction vary according to mouse age and brain region. This isolation protocol has been tested with CD-1® mice aged from embryonic day 18 (E18) to adult. DPBS/BSA buffer: Prepare a solution containing Dulbecco’s phosphate-buffered saline (DPBS) with Ca2+ and Mg2+ and 0.5% bovine serum albumin (BSA) by diluting MACS® BSA Stock Solution (# 130‑091‑376) 1:20 with DPBS. Keep buffer cold (2−8 °C). Degas buffer before use, as air bubbles could block the column. 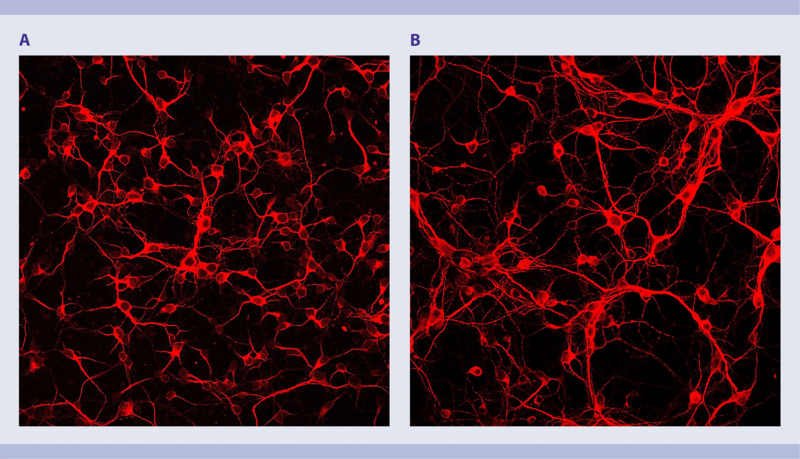 MACS Columns and MACS Separators: neurons can be enriched by depletion using LS Columns. Depletion can also be performed by using the autoMACS Pro Separator. Fluorochrome-conjugated antibodies for flow cytometry analysis, e.g., Anti-Biotin antibodies conjugated to PE or APC, or Anti-ACSA-2-PE (#130-116-243), Anti-O4-PE (#130-109-199), CD11b-FITC (# 130-110-837). Learn more about our antibodies and dyes. DPBS/BSA buffer: Prepare a solution containing Dulbecco’s phosphate-buffered saline (DPBS) with Ca2+ and Mg2+ and 0.5% bovine serum albumin (BSA) by diluting MACS® BSA Stock Solution 1:20 with DPBS. Keep buffer cold (2–8 °C). Prepare fresh on the day of use and degas the buffer, as air bubbles could block the column. For cell culture, prepare the following medium: MACS Neuro Medium containing 2% MACS NeuroBrew®-21, 1% penicillin/streptomycin and 0.5 mM L-glutamine. Dissociate mouse neonatal brain using the Neural Tissue Dissociation Kit – Postnatal Neurons. Follow the protocol of the kit data sheet. Isolate neurons from the single-cell suspension using the Neuron Isolation Kit, mouse. Follow the protocol of the kit data sheet. The recommended antibody dilution for labeling of cells is 1:10 for up to 1×10⁶ cells/50 μL of DPBS/BSA buffer. Analyze 100 μL of the positive and 100 µL of the negative fractions. Optionally, also analyze 20 μL of the original fraction. Centrifuge at 300×g for 5 minutes. Aspirate supernatant completely. Resuspend up to 1×10⁶ nucleated cells per 45 μL of DPBS/BSA buffer (see "Things to prepare in advance of tissue dissociation and cell culture"). Add 5 μL of Anti-Biotin-PE. Wash cells by adding 1 mL of DPBS/BSA buffer and centrifuge at 300×g for 10 minutes. Aspirate supernatant completely. Resuspend cell pellet in a suitable amount of DPBS/BSA buffer for analysis by flow cytometry, e.g., using the MACSQuant® Analyzer 10. Plate 1×10⁵ cells in 50 μL of prepared medium as a drop in the middle of each well of a coated 24-well plate (see "Things to prepare in advance of tissue dissociation and cell culture"). Add 500 μL of prepared medium. High-purity neuron population in culture. P1 mouse cerebral hemispheres were dissociated using the Neural Tissue Dissociation Kit – Postnatal Neurons. Subsequently, neuronal cells were isolated using the Neuron Isolation Kit, mouse. Neurons were cultured in MACS® Neuro Medium, MACS NeuroBrew®-21, 1% P/S, and 0.5 mM L-glutamine on PLL-coated glass coverslips (1×105 cells per well of a 24-well plate). After 2 days (A) and 6 days (B), in vitro cells were fixed and stained with the neuron-specific antibody Anti-MAP2 (red) and the astrocyte-specific antibody Anti-GLAST (green). P1 mouse cerebral hemispheres were dissociated using the Neural Tissue Dissociation Kit – Postnatal Neurons. Subsequently, neuronal cells were isolated using the Neuron Isolation Kit, mouse. Neurons were cultured in MACS Neuro Medium and MACS NeuroBrew-21, 1% P/S, and 0.5 mM L-glutamine on PLL-coated glass coverslips. After 2 days (A) and 6 days (B), in vitro cells were fixed and stained with the neuron-specific antibody Anti-MAP2 (red) and the astrocyte-specific antibody Anti-GLAST (green).